The Huawei P30 lite is a lightly-specked version of the brand's 2019 Q1 P30 flagship. Its biggest cons include the absence of NFC support on its specs list, which we find particularly weird, knowing that Near Field Communication was all but a standard pro among upmarket smartphones as of this data-driven Phonerated review. Also, it does not come with any rugged rating for splash- and dust-resistance -- the P30 passes IP53 standards, while the P30 Pro boasts an IP68-rated shell. Jumping over to its selling points, the P30 lite delivers a competitive triple rear camera that's made up of a 24-megapixel f/1.8-aperture primary lens, an 8-megapixel ultra-wide-angle lens for landscape shots that are up to 120 degrees wide, and a 2-megapixel depth-sensing lens for bokeh photography. Among its imaging pros and cons are 3D Panorama, electronic image stabilization, and light painting. Just like its P30 and P30 Pro siblings, this lite edition also brushes shoulders with some of the best selfie-driven models of its time, touting a 32-megapixel BSI-sensor front-facing camera on its tiny display notch. 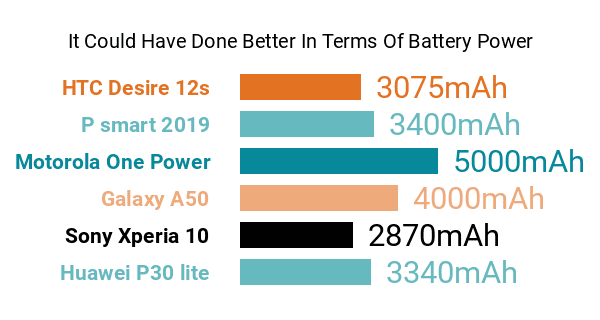 Speaking of display, the P30 lite closely resembles its mother model with its 6.2-inch 1080p-only IPS screen -- keep in mind that the best phablets on the market bluster with premium 2K-1440p screen resolutions. As for its hardware pros and cons, this P-series model is powered by a middle-class Kirin 710 processor consisting of a quad-core 2.2GHz primary cluster and a secondary quad-core cluster running at 1.7GHz. It is accompanied by a sizable 6GB RAM and a 1GHz Mali-G51 graphics engine that enables GPU Turbo 2.0, which is dedicated to improving the phone's overall performance when gaming. On storage duties is a 128GB native memory, while a 3340mAh battery, which awkwardly scores only a 12.2-day continuous standby time , is in charge of its power supply. It runs on a version of Android 9.0 Pie that's overlaid with Huawei's EMUI 9.0.1. So, while it flounders in comparison to a few full-blown flagships hardware-wise, the P30 lite still sounds like a feasible choice for mobile photographers, gamers, and selfie addicts.